With the Israeli bombing of Syria, will the Syrian civil war spread throughout the region? What is Israel’s political calculation here? Is Obama’s red line regarding chemical weapons just a hoax? And what will happen in Syria if there is a regime change? CrossTalking with Pepe Escobar, Christopher Chivvis and Geoffrey Ingersoll. Canada’s minister of foreign affairs, John Baird, claims that Canada’s Middle East policy is motivated by Human Rights concerns and considerations of what is in the Canadian national interest. However, Baird’s sincerity was brought into question this week with the announcement of a Canada-United Arab Emirates nuclear cooperation agreement. Begins with ending arms, cash, and support for terrorist front. July 16, 2012 – At 20 million, if even half of Syria’s population rose up against the government of President Bashar al-Assad, armed with pointed sticks, the revolution would be over in an afternoon. Instead, it has dragged on for nearly a year and a half, consisting of hit-and-run battles, terrorist bombings, and cross-border infiltration – indicating that but a slim minority has “risen up” and of that minority, the vast majority of them are sectarian extremists – admittedly many are not even Syrian. Most importantly, it is not within Syria, but beyond its borders, that these “rebels” derive the summation of their support. Since 2007, interests within the US, Saudi, and Israeli governments, along with other Gulf State despots and proxies in both Turkey and northern Lebanon, have been assembling from across the Arab World an army of sectarian extremists, with close ties – even direct affiliations with Al Qaeda. Exposing this was US journalist, Seymour Hersh, who published his findings in a 2007 New Yorker article titled, “The Redirection.” Readers should note that Al Qaeda itself was an “Arab foreign legion” of sorts, created in the 1980’s also by the US to fight its proxy wars. These militants drawn from across Saudi Arabia, Jordan, UAE, Qatar, Lebanon, Turkey, Libya, and Iraq, were armed, funded, and staged along Syria’s borders between 2007-2011. The Syrian Muslim Brotherhood, who had fought a failed but brutally violent campaign to establish a faux-theocracy in the late 70’s and early 80’s was also contacted during this time by the West, receiving funding and directives to begin preparing for the violent overthrow of the Syrian government. Photo: The face of Libya’s NATO-backed “revolution” was literally Al Qaeda – effectively ending 10 years of “War on Terror” mythology. 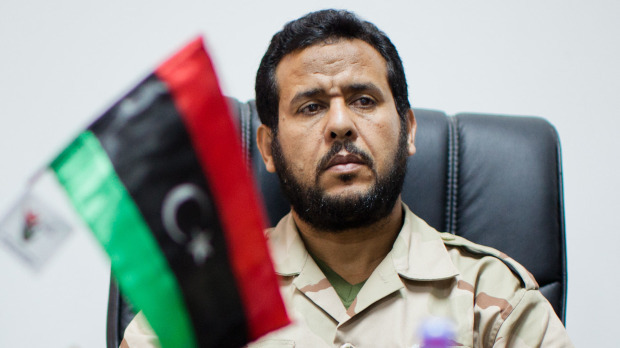 Abdul Hakim Belhaj, a Libyan Islamic Fighting Group (LIFG) commander, led sectarian extremists with NATO arms and air support against Qaddafi, and is now involved directly in arming, training, and supplying Libyan militants to NATO’s subversion of Syria. Belhaj and his LIFG mercenaries are just one of many groups of foreign fighters assembled by NATO to infiltrate and undermine Syria. Two years before the “Arab Spring” would be “sprung,” the US State Department began training and funding activist leaders from across the region, including Syria and Lebanon. They received up to $50 million, communication equipment, and were invited to training sessions organized by the US State Department itself. 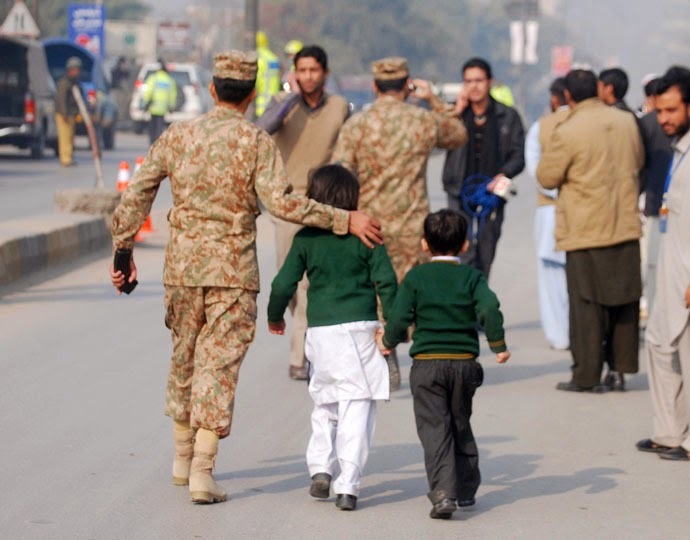 The goal was, admittedly, to send them back to their respective countries to train others, thus creating a “ripple effect.” This was later revealed by Assistant US Secretary of State for Human Rights, Michael Posner in an April 2011 AFP report. This indicates that both the “peaceful” and militant components of the Syrian so-called “uprising” were premeditated, organized, and manipulated geopolitical calculations for achieving Western foreign policy objectives, not to fulfill the “democratic aspirations” of the Syrian people. In fact, the inclusion of violent ideological militants in the equation almost certainly ensures such “aspirations” will never be achieved. 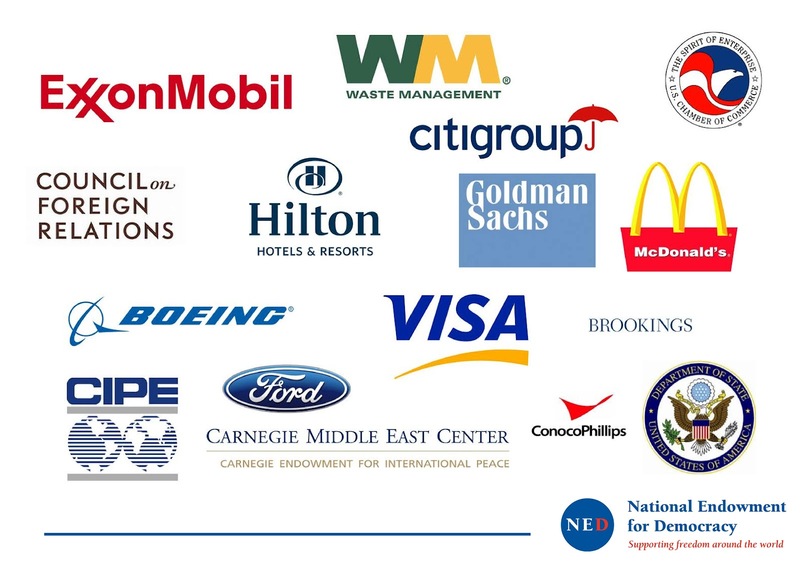 Furthermore, the very organizations and institutions the US State Department used to direct “activists,” namely the National Endowment for Democracy (NED) and its subsidiaries including Freedom House, the International Republican Institute (IRI), and the National Democratic Institute (NDI), are steered not by progressive-liberals from Berkley, but rather names drawn from Boeing, Exxon, Citigroup, Goldman Sachs, Conoco Philips, and other corporate-financier special interests. NED’s board of directors also includes names from America’s pro-war Neo-Conservative establishment including Francis Fukuyama, Zalmay Khalilzad, Will Marshall, and Vin Weber, all signatories of the pro-war, pro-corporate Project for a New American Century. These same interests, in fact, were simultaneously building up both the “pro-democracy” protesters and their violent extremist militant counterparts – with the obvious intentions of couching one within the other to then set the stage for the military intervention they are now incessantly lobbying for. That the events playing out in Syria now were entirely premeditated from abroad by corporate-financier interests couching their aspirations for global hegemony within “democracy promotion,” does not condemn all of Syria’s opposition as “illegitimate.” However, those supporting both the violence created by foreign-funded death squads, and the unyielding interventionist agenda of the West’s so-called “Syrian National Council,” are indeed both illegitimate and a threat to Syrian peace as well as world peace. Perhaps most indicative of just how disingenuous the so-called “Free Syrian Army’s” cause is, is the fact that their primary backers both financially and in terms of supplying military arms, are the despotic absolute monarchies of the Gulf States. These include Qatar and Saudi Arabia – the latter so despotic and nepotistic, the nation itself is named after the unelected, eternally ruling “Saud” family. That they, in concert with the West, seek “democracy” and “freedom” in Syria is an absolute absurdity – with their true intentions of undermining and destroying neighboring Iran the much more plausible, even admitted goal of violently subverting Syria. Both the genesis and perpetuation of Syria’s violence is rooted not within Syria’s borders, but beyond them. Not in the alleys of Syria’s cities, nor the fields of its villages, but in Washington, Riyadh, Doha, Tel Aviv, London, Tripoli, and Ankara. The obvious solution is for the “international community” to recognize, condemn, and end the flow of weapons, cash, and political support provided to overt foreign proxies. Syria’s borders should be secured with vast penalties imposed on Turkey, Jordan, and Lebanon for failing to cooperate with Syrian security forces in stopping the flow of foreign arms, cash, and fighters. The violence could literally grind to a halt overnight, when foreign mercenaries and Syrian Muslim Brotherhood extremists realize the spigot of arms, cash, and impunity had been turned off and the restoration of order throughout Syria made inevitable. Instead, the US, feigning ignorance to the documented role they played in the malicious origin of this conflict, proposes to increase the violence by further arming and providing “air support” for their front of militant extremists, just as they did in Libya to catastrophic effects. They plan on doing this through a UN Security Council resolution loaded with Chapter 7 provisions – meaning military intervention, after a brief “last effort” to implement the UN’s peace plan the US fully prepares to sabotage. Since another NATO-led military campaign is universally reviled, the West has organized a series of publicity stunts to shock, scare, panic, and stampede their resolution through the Security Council. These include confirmed fabrications regarding the latest “massacre” in Tremseh, Syria – which UN monitors have concluded was instead a battle. 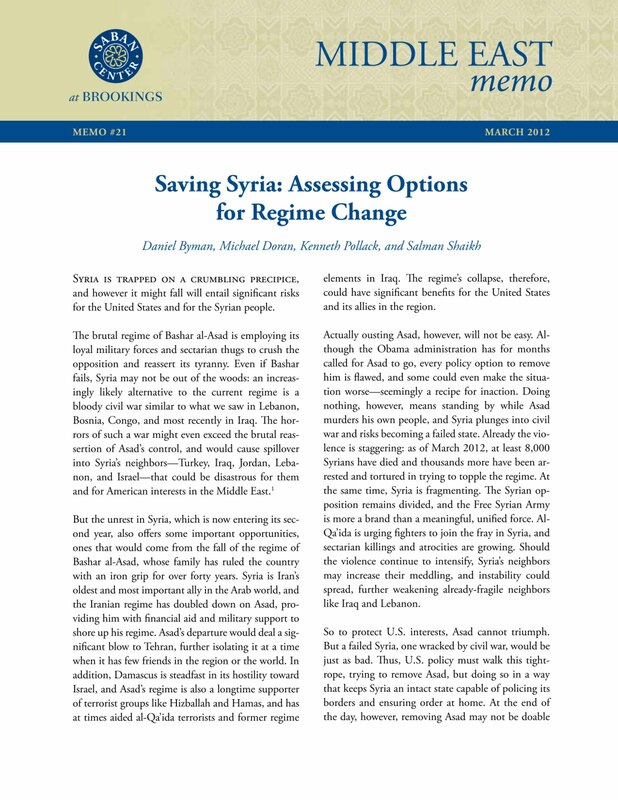 Image: Brookings Institution’s Middle East Memo #21 “Assessing Options for Regime Change (.pdf),” makes no secret that the humanitarian “responsibility to protect” is but a pretext for long-planned regime change. Failing to achieve this, US policy makers are satisfied to arm and fund militants in an effort not to end the violence but to perpetuate it and its costly effects to keep a “regional adversary weak.” Clearly, the West’s interests in Syria are geopolitical, not humanitarian, and plan options to purposefully compound the humanitarian catastrophe it has engineered from the very beginning. This unconscionable, callous act of hostility toward Syria and its people – admits openly to using the militants it hails as “freedom fighters” to mire Syria in protracted violence destroying the lives, prospects, and potential of some 20 million people. This policy paper, crafted by the Fortune 500-funded Brookings Institution, illustrates the true self-serving nature behind the West’s “concern” for Syria. It is essential, not only for the people of Syria, but for the entire planet placed in danger by the precedent being set by allowing the West to continue on with this insidious agenda, for the UN Security Council to block any resolutions put forth designed to implement it. Russia and China have been wrongfully berated for not capitulating to Western demands that military intervention be green-lighted so the atrocities committed by NATO in Libya can be repeated in Syria. Considering the premeditated, foreign orchestrated nature of Syria’s violence, and that it is the West itself that is responsible, it is unconscionable that they remain free of international condemnation, let alone given a say in how the bloodbath of their own creation is resolved. For the vast majority of humanity, excluded from this process – we are given an instructive example of how dangerous and ineffective international law is – to the point where it has become a tool used by elitist perpetrators of vast crimes against humanity rather than a defense against them. But while we have no say in what the UN ultimately does, the monolithic power wielded by the West, granted to them by the fortunes of their immense corporations, financial institutions, and organizations, lays exposed directly to us – open to condemnation, boycotts, and their uprooting through their replacement with local alternatives. The answer to solving Syria’s violence is simple – doing it will take some effort and courage. However, we must not fool ourselves into believing that Syria’s problems are theirs and theirs alone. What the corporate-financier interests are doing to their nation and people today, will embolden and strengthen them for when they finally decide to do it to us tomorrow. In a few months, Dubai will be the stage for a potential firestorm with the Internet at the center. The International Telecommunications Union (ITU) is an extension of the UN that has the control over the Internet in mind. What the UN would like to do to the Internet makes SOPA and PIPA seem like harmless legislation. Both parties of the UN Congress met and agreed to resist the attempt of the UN to usurp the Web “with everything [they] have”. The Internet has become this economic and social juggernaut not because governmental actors willed it to be so, but because the government took a step back and let the private sector drive its evolution. International regulatory intrusion into the Internet would have disastrous results not just for the United States, but for people around the world. Seems that when controlling the Internet is not coming from the Big Brother usurpers within the US government, Capitol Hill gets a bit concerned. For quite some time now, the House and the Senate have been promoting SOPA and PIPA that would give law makers untold power over Internet Service Providers (ISPs) and copyright protection that could shut down any website on an assertion (regardless of the evidence to prove it). Not to mention moving to abolish the 1st Amendment on the Web with over-reaching Orwellian restriction. The UN’s ITU proclaims that because the Internet is a “global entity” that the UN should have jurisdiction over it, manage its abilities according to global UN standards, and engage restrictions that could be installed at the fundamental level of the Internet to prevent any infractions of international mandates. The UN wants to include the domain-name system along with the Internet Corporation for Assigned Names and Numbers (ICANN), which is currently a privately owned US non-profit organization. When an invention becomes used by billions across the world, it no longer remains the sole property of one nation, however powerful that nation might be. ICANN operates now as a multi-stakeholder that involves groups like the Internet Engineering Task Force and the World Wide Web Consortium. Despite critics and alleged conflicts of interest, the expansion of top-level domains, this action is a sort of “land grab” for domain names. Vinton Cerf, TCP/IP developer and Chief Internet Evangelist at Google, spoke before a congressional subcommittee where he stated that giving the UN power of control over the Internet would subject the Internet to the decisive ideals of an international body who has no intention of preserving the free flow of information. This action would end free speech on the Internet. Such a move holds profound – and I believe potentially hazardous – implications for the future of the Internet and all of its users. If all of us do not pay attention to what is going on, users worldwide will be at risk of losing the open and free Internet that has brought so much to so many. It is expected that the ITU would begin a sort of taxation that international telecommunications corporations would be expected to pay for the ITU’s handling of web traffic as it flows across the world. ITU members would be privy to the newfound cash flow that would be in the hands of international governance; which could begin to line the pockets of the UN in record time. In the Wall Street Journal, Robert McDowell spoke about the egregious countries who belong to the ITU and the restraint of freedom that will surely follow if the UN is allowed to govern the Internet. The UN and the ITU are powerful international agencies whose interests over the Internet are far more controlling than SOPA and PIPA were ever meant to be. Without action taken now, in December of this year, the Internet as we know it will disappear not long after the meeting in Dubai.